Fitaide Pro, a $5 fitness app for the iPhone and iPod touch from Positech, offers some clever features to help you reach your exercise goals. Plan Your Workout: After determining your fitness level and goals, Fitaide Pro develops an exercise plan for you that includes a schedule of workouts. The app gives you three options for a fitness regime: Couch to 5K or 10K, Weight Loss, or Create Your Own Plan. With these plans you can create, manage and schedule your workouts. 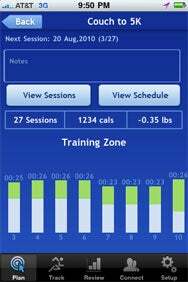 Before you can start the Couch to 5K or 10K or the Weight Loss programs, though, you must first take the fitness assessment, in which the app calculates your fitness level. I had a couple of false starts with the fitness assessment feature. The first two times I tried to take the fitness assessment while on the treadmill at the gym, the app didn’t give me the option to check my heart rate. It was only after I gave up on the treadmill and tried the spin bike that I was able to complete the assessment with a heart rate check. A screen times you as you count your pulse, you enter your count, and then the app figures out your fitness level. After all that, I was able to create a Couch to 5K and also a Weight Loss program. When booking my sessions into a plan, I had to select the days and same time every day. I don’t work out that way—some days I exercise in the mornings, sometimes on my lunch break, and other times after work. But I was able to override the time and start the session when I wanted. During workout sessions (and when taking the fitness assessment test), Fitaide Pro offers audio cues in which a voice tells you where you are in the session and encourages you to keep going. All this time, the app counts the calories burned, the workout time, and (when appropriate) the miles you’ve logged. Tapping a music icon lets you listen to playlists stored in the iPod app on your iOS device. In addition to Fitaide’s plans, I was able to create one on my own. You can schedule up to six sessions a week while also setting the length of each session and segment. You can set up a weekly target—calories, distance, duration, and so on. And you can set up a challenge with friends or even sign up for an event or charitable cause through the app. While Fitaide Pro costs $5, a free version of Fitaide offers the same features as the paid app, with the exception of the fitness plans feature. (Those can be added to the free addition via in-app purchase; users who bought Fitaide when it was a paid app can add up to three fitness plans for free, the developer says.) The free app provides a way to take Fitaide for a test drive before plunking down your cash. There’s much to like about Fitaide Pro, particularly how easy it is to create a sensible workout plan, though the app would freeze occasionally for a few seconds during my tests. Still, it offers a number of attractive features such as the ability to access playlists from within the app and its use of the accelerometer to track movement in multiple directions.